2 Varieties Of The 1981 Proof Set: Do You Own The Valuable One? 1981 Type 1 Proof Sets include the same S mintmark used in late-1979 and throughout 1980. 1981 Type 2 Proof Sets were packaged with 1981 proof coins that have more well-defined S mintmarks than those used from late-1979 through mid-1981. Because relatively few 1981 Type 2 proof sets were made, they are worth significantly more than 1981 Type 1 proof sets. In fact, while the 1981 Type 1 set usually sells for no more than $10 to $12, 1981 Type 2 sets can easily command prices well over $250. How do you know what a “Clear S” (Type 2) is supposed to look like versus a “Filled S” (Type 1)? Why is the 1981 Type 2 proof set worth so much more money — is it really that rare? The 1981-S Type 2 “S” mintmark has more bulbous serifs (rounded ends) than the 1981-S Type 1 “S” mintmark. In fact, these distinctions can be used for telling apart all 1981-S Type 1 and Type 2 proof coins — not just the 1981-S pennies. While all 1981-S Type 1 and 1981-S Type 2 proof coins have similar differences between the 2 types of “S” mintmarks, regardless of denomination, the values for these coins range widely! What’s the difference in price between a proof 1981-S Type 1 Susan B. Anthony dollar and a 1981-S Type 2? Oh… about $100! That’s right, 1981-S Type 2 coins are far more valuable than their Type 1 counterparts — even on an individual basis. There’s actually huge demand for individual 1981-S Type 2 proof coins because of coin collectors who are building albums of individual coin series (such as Lincoln cents). These collectors need single 1981-S Type 1 and Type 2 proof Lincoln pennies to insert in their albums in order to complete their collections. The most valuable of all 1981-S Type 2 proof coins is the Susan B. Anthony dollar coin. Values are for Deep Cameo 1981-S proof coins with no significant surface marks or damage. Impaired proofs are worth less, while Proof-70 examples are generally worth more. If you’re in the market to buy a 1981-S Type 2 proof set, don’t just go for the cheapest one! You see, the “new” 1981-S Type 2 proof coins weren’t all introduced in all 1981 proof sets at the same time. The various denominations with the “Clear S” mintmark style were initially packaged at different times — with only a relatively small number of 1981-S proof sets carrying all Type 2 proof coins. This means many 1981 proof sets contain a mix of Type 1 and Type 2 proof coins. In many cases, 1981 proof sets advertised as “Type 2” have only a 1981-S Type 2 Susan B Anthony dollar, or perhaps a 1981-S Type 2 Roosevelt dime and Susan B. Anthony dollar, or some combination thereof. While 1981-S Type 2 proof sets generally start in price at around $150, these are often sets that contain just the 1981-S Type 2 dollar — whereas most (or all) of the rest of the coins in the set may be Type 1 proofs. 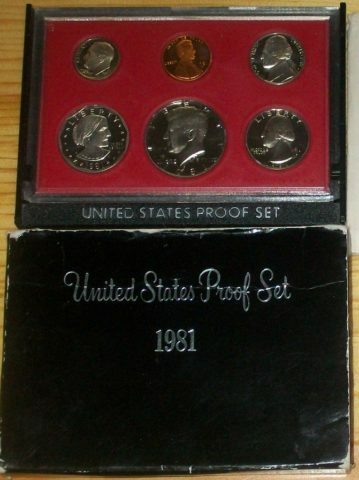 A fully Type 2 1981 proof set with all 6 coins bearing “Clear S” mintmarks can run $250 to $300 or more. So just be sure you know what you’re buying before you jump on a deal for a cheap 1981-S Type 2 proof set. And… make sure that you can tell Type 1 and Type 2 “S” mintmarks apart for yourself! Why Is The 1981-S Type 2 Proof Set So Rare? The United States Mint packaged a total of 4,063,083 proof sets in 1981 — including both 1981-S Type 1 and Type 2 proof sets. The vast majority of these are 1981 Type 1 proof sets. Unlike the Clear “S” mintmark on 1981-S Type 2 proof coins, there is no clarity on exactly how many Type 2 proof sets were made in 1981. Coin World states less than 10% of 1981 proof sets are Type 2. That would put the estimated number of 1981-S Type 2 proof sets at less than 400,000! The reason there is such a small number of 1981-S Type 2 proof sets around is that the US Mint didn’t begin using the new “S” mintmark punch until late in 1981 — when most of the proof set run was already completed for the year. Collectors didn’t become aware of the change in mintmark styles until after the new “S” mintmark was already being used. But the news of the 1981-S Type 2 proof sets made waves in the coin collecting community, which at the time was enjoying a boom in popularity from investors who had recently (the late ’70s) begun pumping a ton of new money into the coin market. Also, the bullion world was enjoying headlines as gold prices and silver prices spiked to then-all-time highs, and this excitement spilled over into the coin industry. Even after the coin market lost steam as the 1980s came to a close, prices remained buoyant on the 1981-S Type 2 proof coins. Decades later, 1981-S Type 2 proof sets remain popular with collectors of modern coins and are among the most sought-after proof sets around.